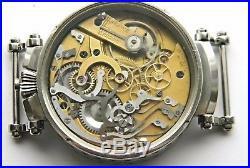 We are offering, high quality wristwatch cases of our in-house design for marriage watches using antique pocket watch movements. This case has a benefit of top sapphire (scratch resistant) crystal and is beautifully engraved. 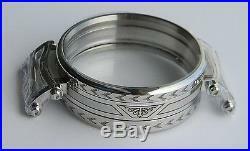 Diameter: 47.50 mm. Length including lugs: 70 mm. Thickness: 17.50 mm. Strap: 22.00 mm. In addition to the standard. 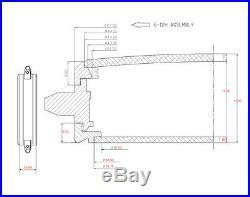 Stainless-steel grade 316 L. 3 parts case with. Top and bottom glazed with mineral glass. We have designed and created cases with. Screw-able bottom frames to make it easier to open and reach the mechanism for maintenance or repair. This replaces the more common press closing frames. 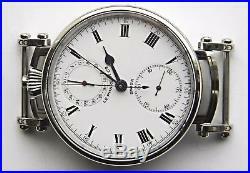 With easy unscrewing of the bottom frame any enthusiast can fine-tune the accuracy of their watch by simply adjusting the hair spring regulator, without the need to go to a watchmaker. Both crystals are glued to the bezel and to the bottom frame, which offers greater water resistance. We also offer 6 other similar cases, all with top and bottom mineral crystals. 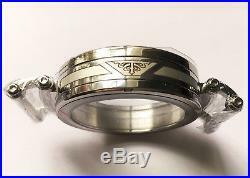 One is fully engraved, two partially engraved and one highly polished. Further 2 cases (one partially engraved and one highly polished) are with thinner screw-able bottom frames. Thickness: 14.65 mm. PLEASE VISIT OUR OTHER AUCTIONS. All our cases are ideal for Hebdomas and Hebdomas-style and chronograph pocket watch movements as well as Alpine, JWC Kal. 52 and 53, Longines, Moser, Omega, Tavannes, System Glashütte, etc. The watches pictured are samples of how the cases might be used and are not for sale. 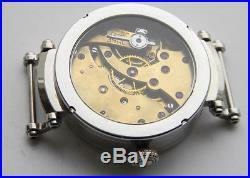 A top frame in a marriage watchcases usually being open only for installing of a movement. That is why we designed our cases with very tightly fit press closing top frame, which made it better moisture proof. To open it first loosen the frame by very lightly hammering a scalpel or any very thin blade into the gap in 2/3 places. It should make a small gap. Than use thinly sharpened back case opener or knife. Be careful not to scratch edges of both top frame and the case body. Our cases are designed to fit most sizes of movements. 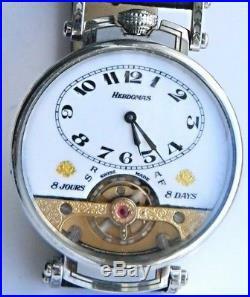 Nevertheless when installing any movement a slight adjustment of the case is required. For example, depending on the movement, a hole for a stem could be drilled in position 3 or 12 and a hole for a pusher in any appropriate position for a movement. The diameter of movements which can be fitted without any further adjustment to the case is 41.5 mm with a dial diameter of 43 mm. However using a watchmakers lathe our cases can be prepared for movements up to 44.5 mm and dials for up to 45 mm. It is worth noting that some movements have superfluous overhangs in the main plate. These could be easily turned, cutting down the diameter of the movement. When preparing antique movements for marriage watches we strongly recommend using a professional watchmaker familiar with the process. The item “ENGRAVED WRISTWATCH CASES WITH TOP SAPPHIRE CRYSTAL FOR POCKET WATCH MOVEMENTS” is in sale since Saturday, July 29, 2017. 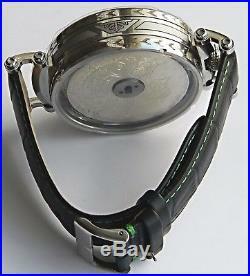 This item is in the category “Jewellery & Watches\Watches, Parts & Accessories\Parts, Tools & Guides\Parts”. The seller is “borkowy52″ and is located in Edinburgh. This item can be shipped worldwide.